Experts agree, Use Cases are the most effective means of capturing and documenting functional requirements. With Visual Use Case, you can write effective Use Cases easily, in less time, and with unprecedented precision. What is Visual Use CaseTM 2009? Visual Use CaseTM is a revolutionary, easy to use Use Case Authoring & Diagramming tool. document logic precisely using "Structured English"
generate presentation quality documents with a single click! Whether you are new to Use Cases or you are an experienced Business Analyst, Visual Use Case is guaranteed to fit your needs. Visual Use Case will help you write effective Use Cases faster and help you document your system's requirements accurately. How does Visual Use CaseTM fit into your project? Experts agree, the most important element of Use Case Analysis is the authoring of Use Case "flow" or "narrative". However traditional UML tools provide poor support for this all important activity. As a result, project teams often use word processors and a myriad of templates to document Use Cases. Team members use different styles to write Use Cases. It is often difficult to tell who has the latest version of a document. It is difficult to tell who changed the Use Case and when and most importantly "what was changed?". If a Use Case is modified, what design and code is impacted as a result. Whenever you change a flow-of-events by inserting or removing a step, all steps and corresponding extensions have to be manually renumbered to make the Use Case consistent. And worst of all, much of the effort is wasted because Use Case documents become obsolete very fast, because the step numbering has to be maintained, links to <<include>> and <<extend>> have to be maintained, references from 'Alternate' flows have to be maintained and so on. In short, word processor documents place a heavy workload on team to maintain and ensure that they are current, consistent and distributed to all stakeholders. Visual Use Case provides a highly effective Use Case authoring platform for writing 'live' hyperlinked Use Cases that can be easily maintained and shared with everyone. Whenever needed, you can also generate word processor documents from them. Sample Use Case document automatically generated from Visual Use Case. This template can be easily customized using MS Word! [click on thumbnails for larger picture. Multiple users can connect simultaneously to the Use Case repository. Visual Use Case automatically ensures that two users don't overwrite each others work. Use Cases are stored in industry standard database servers such as Oracle, Interbase, Firebird (included with Visual Use Case). Your users can view the latest versions of use cases that the development team is implementing. Everyone always has access to the latest versions of Use Cases. Automatically keep a record of who changed a use case, when and exactly what was changed. Automatically keep a record of every version of the use case document for reference or lookup. If something goes wrong, you can always backtrack to an older version of use case considered stable. Embed 'live' hyperlinks to <<included>> and <<extended>> Use Cases. Easily navigate to related use cases with a click. Hyperlinks stay valid and active even when you change names for <<included>> or <<extended>> use cases. Say good bye to tedious re-numbering of steps with every change! Want to add step in between a 50 step Use Case with 10 branches to alternate flows? Go ahead and do it, Visual Use Case will automatically re-number steps and maintain correct references from 'Alternate flows' etc. 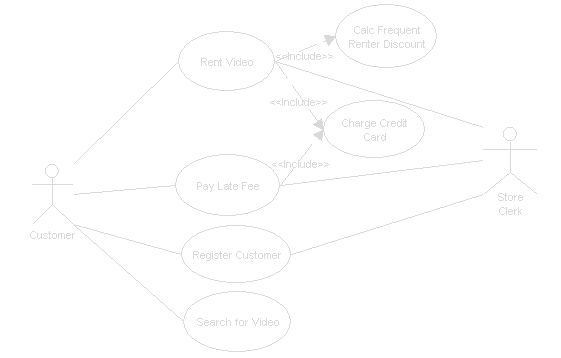 Create Use Case diagrams to communicate better with users and developers. Diagramming tool is integrated with repository. Actors and Use Cases placed on the diagram are automatically available in the repository for further elaboration. 'Rich text editing' feature ensures that you wont miss your favorite word processor. Continue to use your favorite styles such as bold, italics, bullets, embedded tables and images, etc. When needed, generate word processor documents as per your defined templates. Start threaded discussions for any use case or at the project level. Discussions automatically appear in your email inbox and Visual Use Case inbox. Participate by replying from your email inbox or from Visual Use Case Inbox. Place all project documents in a versioned repository accessible to all team members. Communicate requirements, standards, guidelines; even keep test data or any other type of files relevant to the project. Check-in/Check-out feature ensures that only one person is allowed to edit a document at one time. Send messages with attached Visual Use Case records such as a use case. This allows you to communicate with fewer words and yet with more relevant information. Notifications appear in the email inboxes and Visual Use Case inboxes of recipients. Single click on an attachment brings up the detailed information about the attached use case. Presence list - See who is online. Communicate in real time with Visual Use Case users. Capture a screenshot with built-in utility and instantly send it over for a quick review or discussion. Distributed teams easily connect to Visual Use Case server over the internet. Communicate easily with built-in instant messenger and messaging tools. Visual Use Case stores all timestamps internally in GMT (UTC) and displays it in the current user's time zone. Download the 30-days fully functional trial now! What are the System Requirements for Visual Use Case? If you use Use Cases or are planning to use Use Cases to document your system's behavior, Visual Use Case will help improve your team's productivity. Visual Use Case has many benefits to offer, the best way to find out is to experience it for yourself. You can start using Visual Use Case by downloading a free trial version. Click here to download your Visual Use Case now!